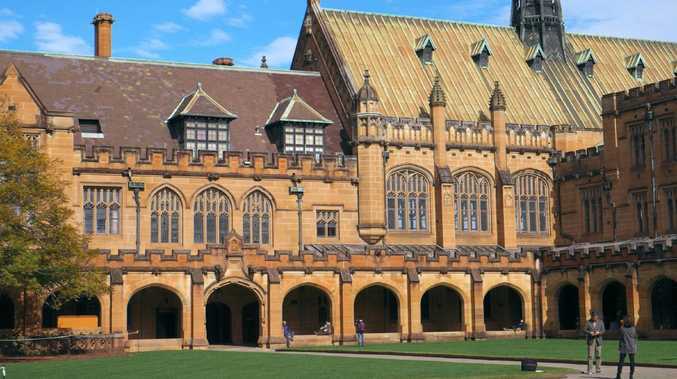 Instances of shocking racist graffiti have been discovered around the University of Sydney. 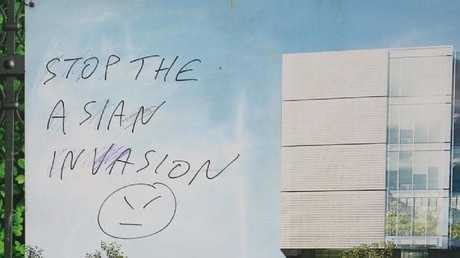 In one case, the words "Stop the Asian invasion" were scrawled across the wall in black paint. In another, the phrase "No more g**ks" was written on a poster of one of the university's buildings. 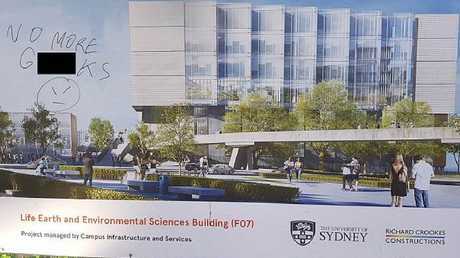 Shocking racist signs were found at the University of Sydney. International House, a residential college housing over 200 students from Australia and overseas, was targeted - as well as bus stops and parking meters around the city's inner west. "This is racist, this is unfair. Seeing an Asian-Australian woman reading this broke my heart. This is not what Australia should be. I hope this sign is removed," the person who uploaded the image wrote. The graffiti used racist anti-Asian slurs. She also said the inappropriate graffiti was "an insolated incident", as opposed to a sign of a systemic problem, despite reports of xenophobic, anti-Chinese comments being exchanged between students at the university. "The University's uniformed Campus Security officers are on site 24 hours a day, 7 days a week, year round and they regularly patrol the buildings and grounds. If any student feels unsafe they should contact Campus Security officers immediately," she said. "We believe this is an isolated incident, if anyone is aware of inappropriate graffiti they should contact Campus Security to have it removed. "The University has codes of conduct and any student, staff or affiliate who breaches an applicable code of conduct may be subject to action and the matter if appropriate may be referred to the police. 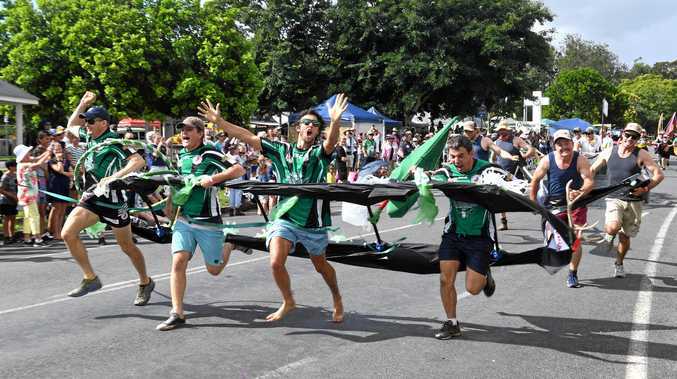 "We do not believe this is a systemic problem but that, from time to time, our campuses, which are accessible to the general public, are subject to the kinds of anti-social behaviour that are sadly evident across the community." 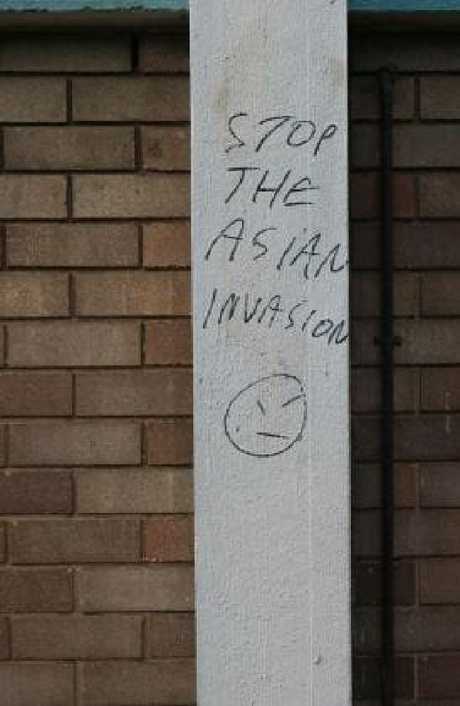 Another abhorrent sign called to ‘stop the Asian invasion’. Last month, a series of racist signs calling for an end to Asian immigration were posted prominently in Sydney's northwest. 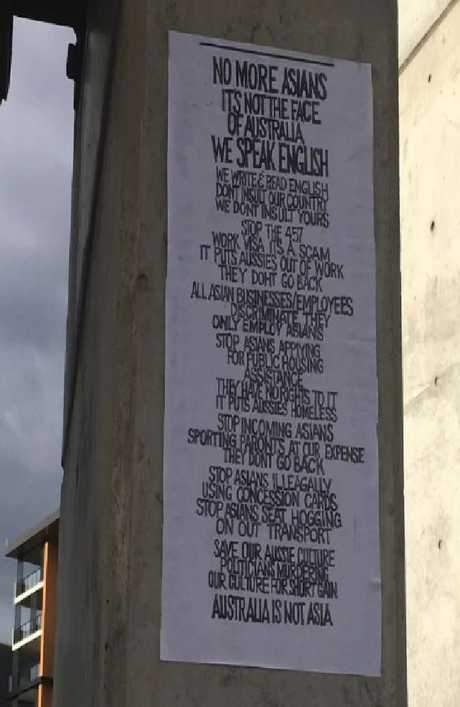 Large handwritten posters saying Asians are "not the face of Australia" and railing against foreign immigration were discovered around Top Ryde, saying "Asians are not the face of Australia" and to "stop the 457 work visa … scam". Racist anti-Asian signs were found in Top Ryde earlier this year.